From desert hiking in Arizona, to clamming on the Maine coast, a huge roster full of activities awaits your family at America's best state parks. State Parks provide the perfect training grounds in which we can introduce our kids to camping by the crashing surf, hiking amidst 100-year-old pines or exploring underground caves. You'll find our nation's state parks offer recreational options and settings as diverse as the regions they span and at a price that meets most vacation budgets. Here are soem of the best family state parks that are completely kid friendly. Grayson Highlands State Park in Virginia - In this Appalachian park, semi-wild ponies that roam free are the big attraction. If you can tear your kids away, there are also 12 miles of hiking and 15 different riding trails, 73 campsites and, if you bring your own horse, 29 sites with stables. Gamble Rogers State Park in Florida - For millions of years, the moon has lured sea turtles ashore in the spring to lay their eggs, which hatch about 60 days later. One of the top spots to learn about this ancient ritual is at this 144-acre park where visitors can stay and watch the sea turtles nest. Cape Lookout State Park in Oregon - A popular campground and day-use area, Cape Lookout is located on a sand spit between Netarts Bay and the ocean, giving you a terrific view of the ocean with easy access to the beach. Beachcombing is popular here, and the park is reputedly a good place to find glass floats. More than eight miles of hiking and walking trails wind through a lush old-growth forest. The Cape Lookout trail follows the headland for more than 2 miles. A bench is located at the end of the trail. Two walking trails -- a nature trail and the Jackson Creek trail -- are perfect for a shorter jaunt. The nature trail gives you a close-up view of native trees and other plants. Brazos Bend State Park in Texas - Come face-to-face with armadillos, marsh rabbits and 30 reptile species in this 4,897-acre park. Camp at one of 77 sites or rent a screened shelter. Bayou Segnette State Park in Louisiana - Spot a napping alligator or a snake in a cypress tree as you hike or canoe this 580-acre park. 99 campsites and 20 cabins make an apt setting for bayou ghost stories. Panola Mountain State Conservation Park in Georgia - Just 18 miles from Atlanta, this 759-acre day-use park specializes in ranger walks, wildlife programs and nature weekends (Birds of Prey and Snakes Alive are two favorites). This unusual park near Atlanta was created to protect a 100-acre granite monadnock (mountain) often compared to Stone Mountain. Hikers may explore the park's watershed and granite outcrop on their own, or they may join park staff for guided hikes onto the restricted-access mountain. Children enjoy the interpretive center with live exhibits. Panola Mountain is National Natural Landmark. Waianapanapa State Park in Hawaii - This ocean park's name means "sparkling water," and when you visit, you'll see why. The lush coastline has a black-sand beach for swimming and snorkeling, and a rich tradition of Hawaiian lore. Call early to rent an oceanside cabin or set up camp near the active blowhole. 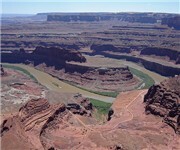 Dead Horse Point State Park in Utah - Stunning views are the draw of this 5,362-acre park, where visitors can gaze for miles down the multicolored Colorado River Canyon. Franconia Notch State Park in New Hampshire - Franconia Notch was the home of the famous Old Man of the Mountain, the same "Great Stone Face" immortalized by Nathaniel Hawthorne and Daniel Webster. While you are here, stop at the Flume Gorge Visitor Center and walk through the renowned Flume Gorge, ride the exciting aerial tramway at Cannon Mountain, and visit the New England Ski Museum. Cobscook Bay State Park in Maine - If you're looking for a seaside adventure, pack your clam rake and head to this 888-acre stretch of undeveloped Maine coastline. The bay takes its name from the Native American word for boiling tide, and the tidal currents here ebb and flow wildly, creating rolling waters, tidal pools and prolific clam flats. It's one of the few places in the state where you can clam without a permit. Kids will be spellbound by the playful seals in the bay and the knobby-kneed moose that roam the woods. Pitch a tent at an oceanside campground, but remember to bundle up for the Maine summer nights. Fort Canby State Park in Washington - This park's bluffs offer the best view of the Graveyard of the Pacific, a churning area where the Columbia River meets the ocean. At this notorious shipwreck site, visitors can explore the North Head and Cape D lighthouses, among the oldest on the West Coast. Cool off on Long Beach Peninsula, where you can collect driftwood, play in the chilly surf or camp overnight. Nickerson State Park in Massachusetts - At this 1,900-acre park on Cape Cod's elbow, you'll find saltwater tidal flats, coastal dunes and kettle ponds, formed by glaciers. Hikers and bikers are likely to catch a glimpse of the Cape's resident turtles, salamanders and great blue herons. Campfire events and a kids' program also make this a favorite place for families to return to each year. Jockey's Ridge State Park in North Carolina - Amble up the East Coast's tallest sand dune for a view that won't quit (a great perch for watching the hang gliders show off). If the thought of having sand in your shoes is troubling, there's a 360 foot boardwalk for those who wish to stay out of the sand. A nightly talk reveals more about how the dunes were formed, as do the day hikes for kids. The 450-acre park has no overnight facilities, but campers can head to nearby private and national park campsites. Hammonasset State Park in Connecticut - Set on Long Island Sound, Connecticut's largest public beach park features a relaxing 2-mile stretch of sand and swimming. Climb out on the rock jetties to fish, stroll down the dune boardwalk or take a spin on the bike path. Not to be missed: Campground Bingo Nights, where the admission price is a returnable can. East Beach State Park in Rhode Island - Catch a snootful of salt air at this 3.5-mile beach park, perfect for building sand castles or just kicking back and watching windsurfers' antics. Be sure to get there early; the 100-car parking lot ($3 to $14 parking fee) fills up fast in the summer. Katy Trail State Park in Missouri - Currently the longest rails-to-trails conversion in the United States, this park runs alongside the Missouri River. The smooth, level grade is ideal for bikes or wheelchairs, and the trailheads make restful picnic spots. Although parts of the Katy Trail are still being developed, visitors will soon be able to travel from St. Charles to Sedalia and find bed-and-breakfasts, nearby campgrounds, cafes, taverns and even local festivals along the way. In more rural stretches, visitors may also get a chance to see deer, bobcats, opossums and soaring eagles. Kanopolis State Park in Kansas - The state's reputation for flatlands is dispelled in this 1,600-acre park, home to canyons, rolling hills and, of course, tallgrass prairies. Hike or bike the 26 miles of trails that wind through Horsethief Canyon (legend has it that local bad guys hid their stolen horses here) or trek to Mushroom Rock, an area of sandstone formations north of the Kanopolis Reservoir. Kids will enjoy the prairie dog town in the Horsethief area, where these bright-eyed characters pop up and down all day long. Ponderosa State Park in Idaho - Set on a peninsula in Payette Lake, this western park is surrounded by 7,000-foot peaks. Hikers can explore everything from sagebrush flats to steep cliff overlooks to forests that contain 300-year-old ponderosa pines before returning to the campground at night. 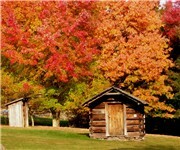 Rock Creek Station Historic Park in Nebraska - Do your hiking on historic ground at this 400-acre park. From the visitor's center, you can see a tremendous trail rut worn by the Pony Express and the Oregon Trail travelers. Glaciers also carved deep ravines and dumped huge boulders in this rugged country, which gives way to open prairies and colorful wild flowers. Next door is the Rock Glen State Wildlife Management Area, with 700 additional acres of natural land, hiking trails, campgrounds and primitive tent sites. De Soto Caverns Park in Alabama - Tie your canoe to the car roof, grab your paddles and head for Little River Canyon on Lookout Mountain, 35 miles of crisp, clear mountain water. In some places, Little River has expert-class white-water rapids, but its quieter stretches are just right for floating, tubing and swimming. Be sure to save time for a visit to 100-foot Desoto Falls, the crowning glory of this 5,000-acre park near the Tennessee border. A lodge, chalets, cabins and campsites offer something for every family's comfort zone. Watkins Glen State Park in New York - A sculptured chasm and 19 waterfalls--some that you can walk under--make this park a choice Finger Lakes destination for families. There is an Olympic size pool for you to enjoy and there is also a Rainbow trout run in the spring. Take the 1.5-mile Gorge Trail down 832 stone steps, then follow in Native American footsteps along the Indian Trail at the rim. In the evening, a sound and light show is projected on the sheer rock wall. Overnighters can choose from among 305 campsites. Willow River State Park in Wisconsin - Water, and plenty of it, is the key to this 2,800-acre park's popularity--which dates back to the Chippewa and Dakota Indians, who once used it as a recreation area. Two lakes, three waterfalls, trout streams and a pond for motorboating make this 80-campsite spot an inviting place to beat the summer heat. Red Rock State Park in Arizona - Javelina and roadrunners own the trails in this 286-acre day-use park, the new gem in Arizona's system. Get your introduction at the Visitor Center, then climb up the Eagles' Nest overlook to gaze out at Sedona's famed red rock area. There are self-guided and ranger-led interpretive walks, video and slide programs, and herbarium and natural history guides at your disposal. More serious hiking and camping are available at the nearby wilderness area. A word to the wise: This is a beautiful but very hot spot with no swimming, so come prepared. Planning on bringing your dog to one of these state parks? Check out Doggies Welcome to see if these state parks have off-leash dog parks or are even dog friendly.